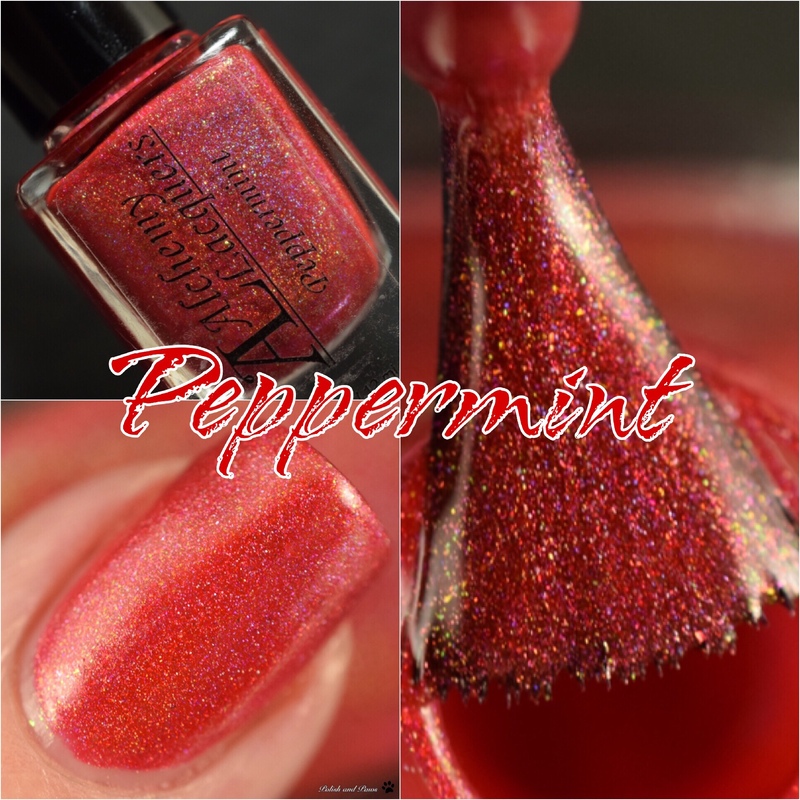 Peppermint is described as a red nail lacquer containing lime/green/turquoise/blue shifting shimmer with a linear holographic finish. Flawless formula. 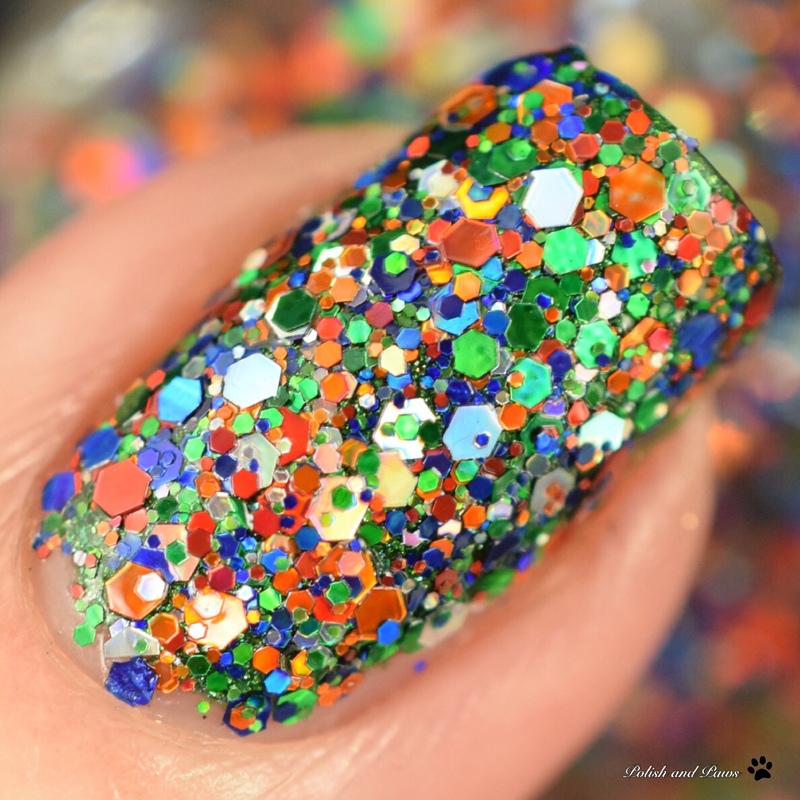 My swatches show 2 coats with glossy top coat. 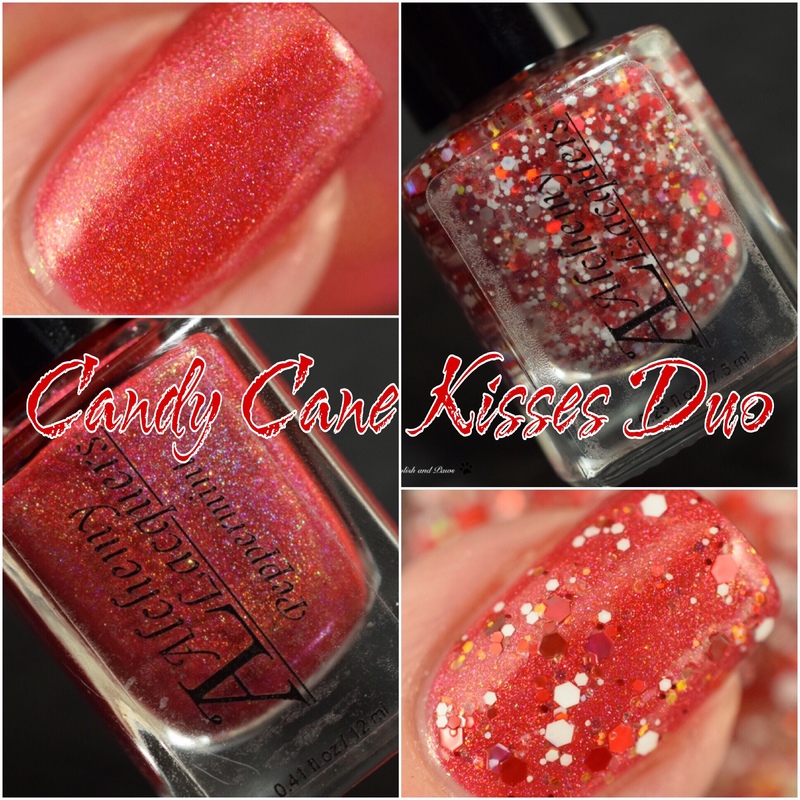 Candy Cane is described as a topper containing various sizes of red matte/holographic, white matte glitter and red/green shifting iridescent glitter. For these swatches I painted on one coat over Peppermint, with the exception of my ring finger where I sponged it on for full coverage. 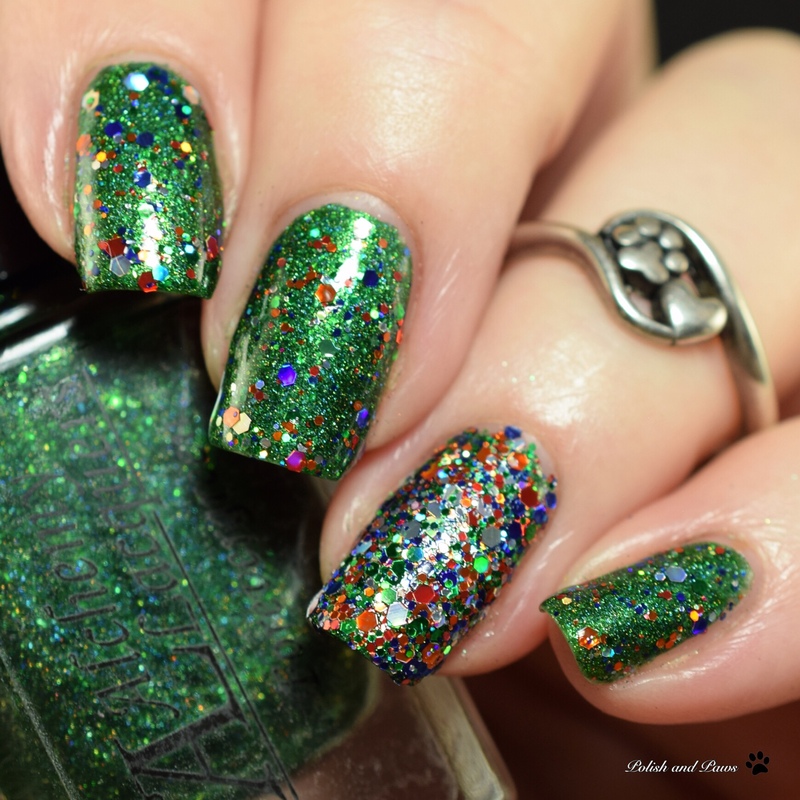 Forever Green is described as a holiday green nail lacquer containing green/turquoise/blue/purple shifting mini flakes with a linear holographic finish. 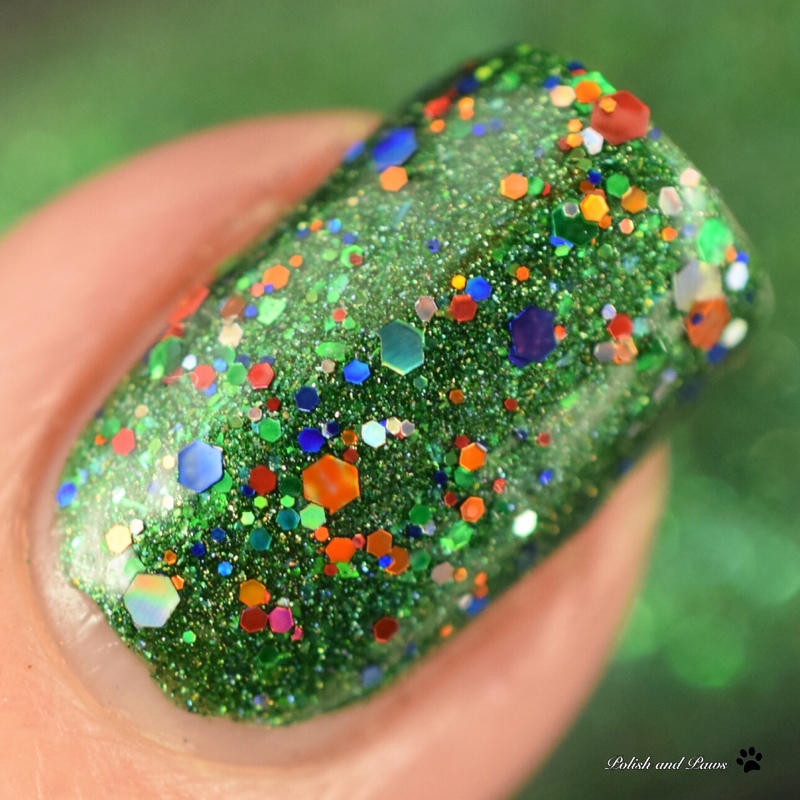 This green is everything! Such a rich deep color. 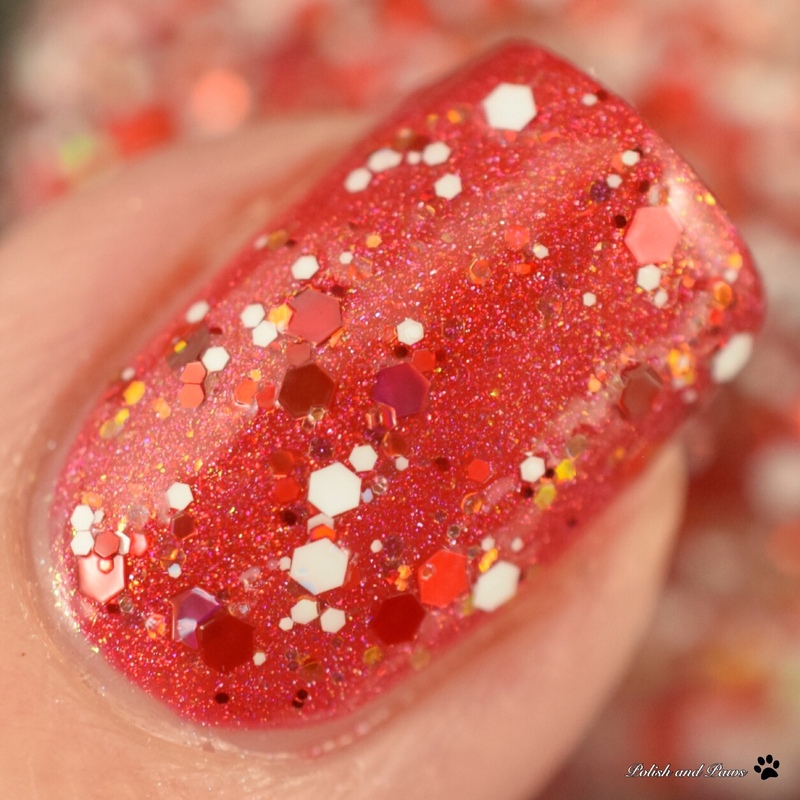 My swatches are 2 coats followed by glossy top coat. Fantastic formula. String of Lights is described as a topper containing various sizes of red, orange, green, blue, and silver holographic glitter. 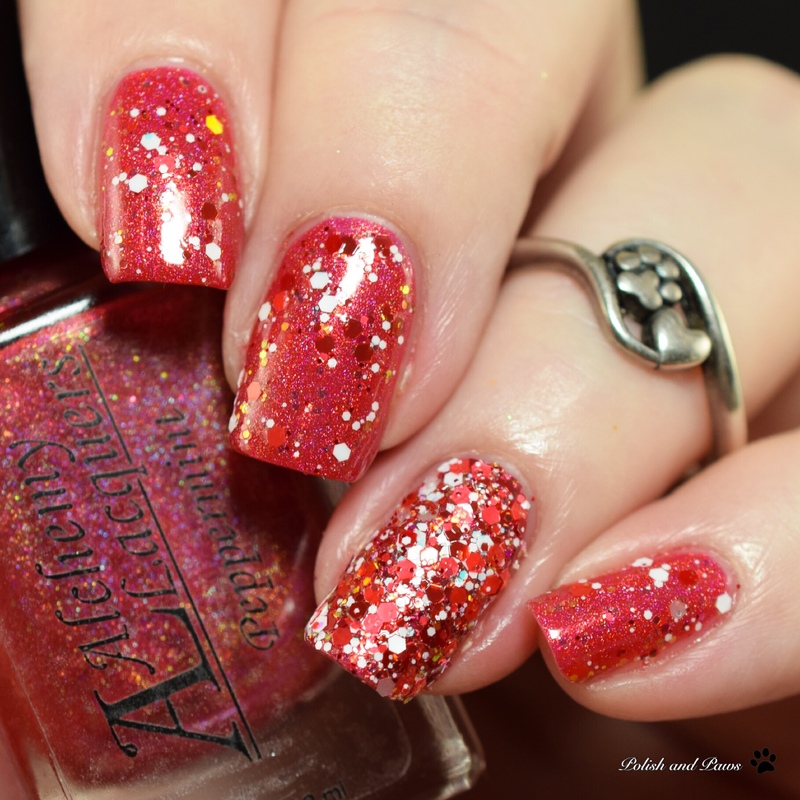 This may be my favorite glitter topper. I love how the combination totally looks like a christmas tree. 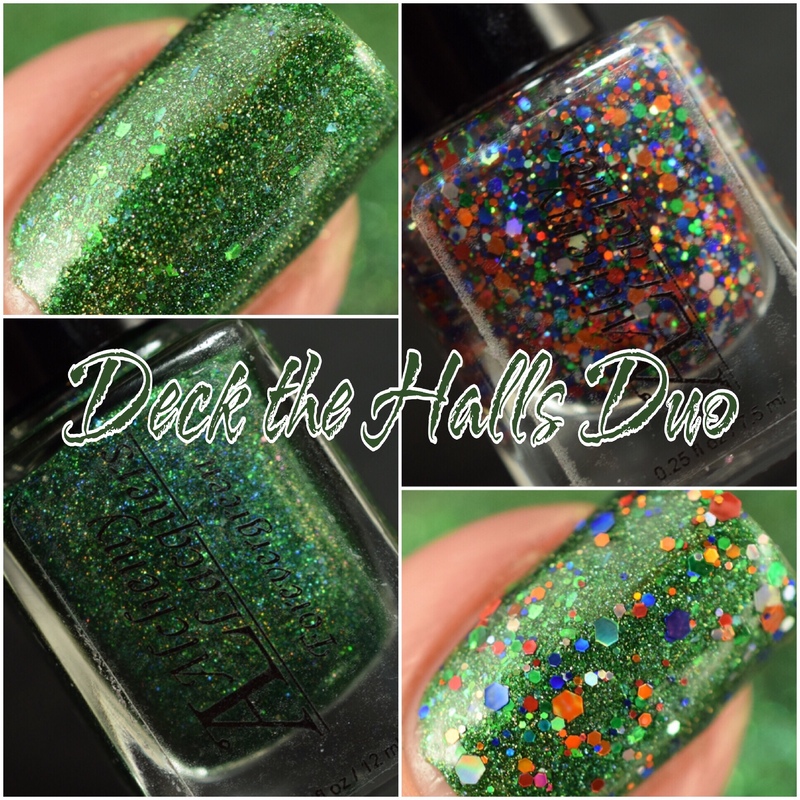 For these swatches I painted one coat over Forevergreen, with the exception of my ring finger where I sponged it on for full coverage. 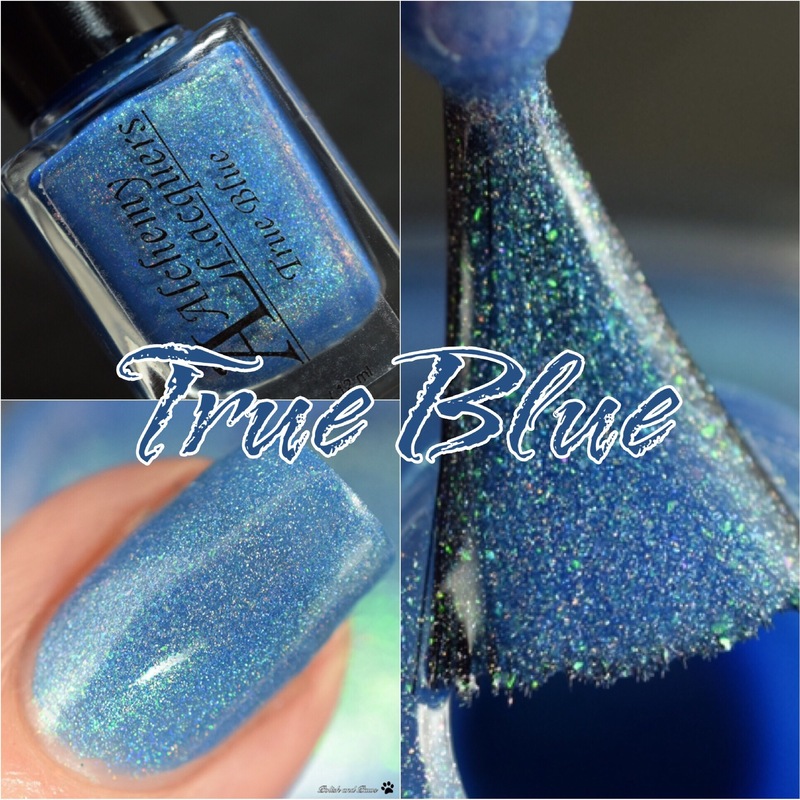 True Blue is described as a royal blue nail lacquer containing green/purple/pink/copper shifting shimmer with a linear holographic finish. 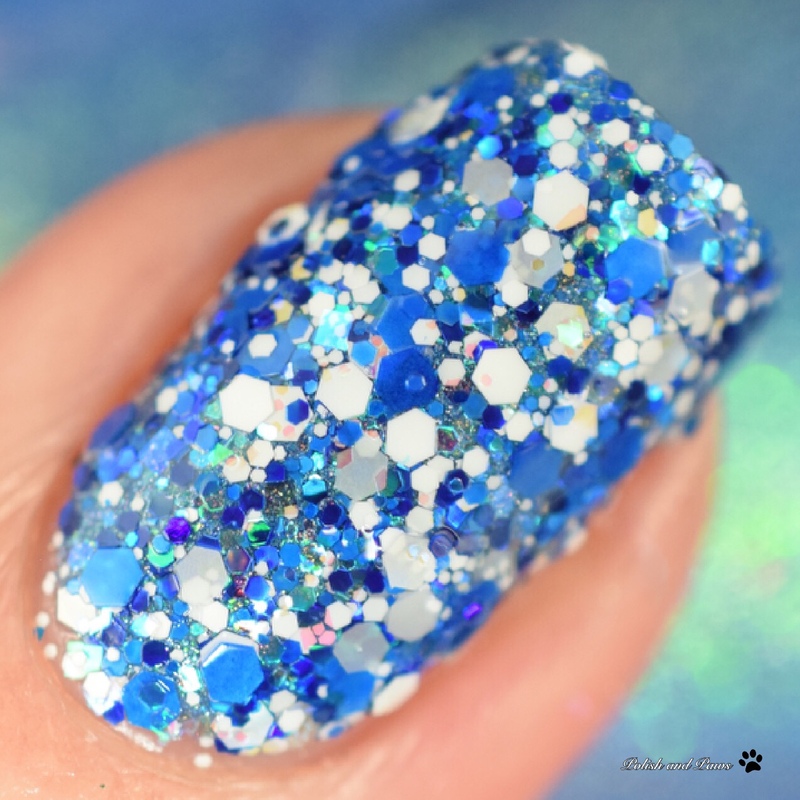 To me this is softer than a royal blue, I would describe it as an azure blue. Beautiful regardless! 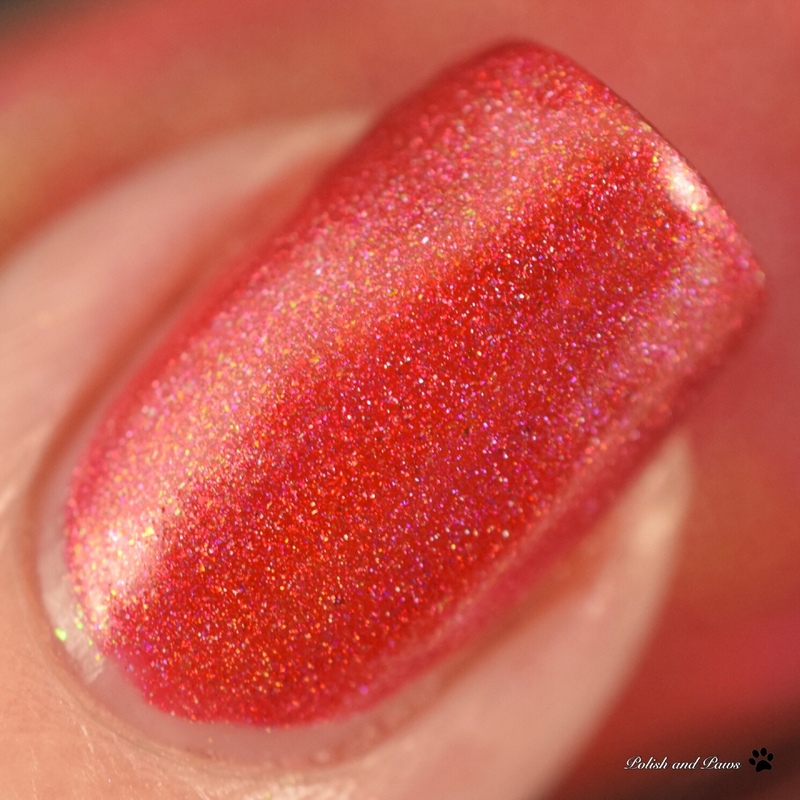 This is 2 coats with glossy top coat. 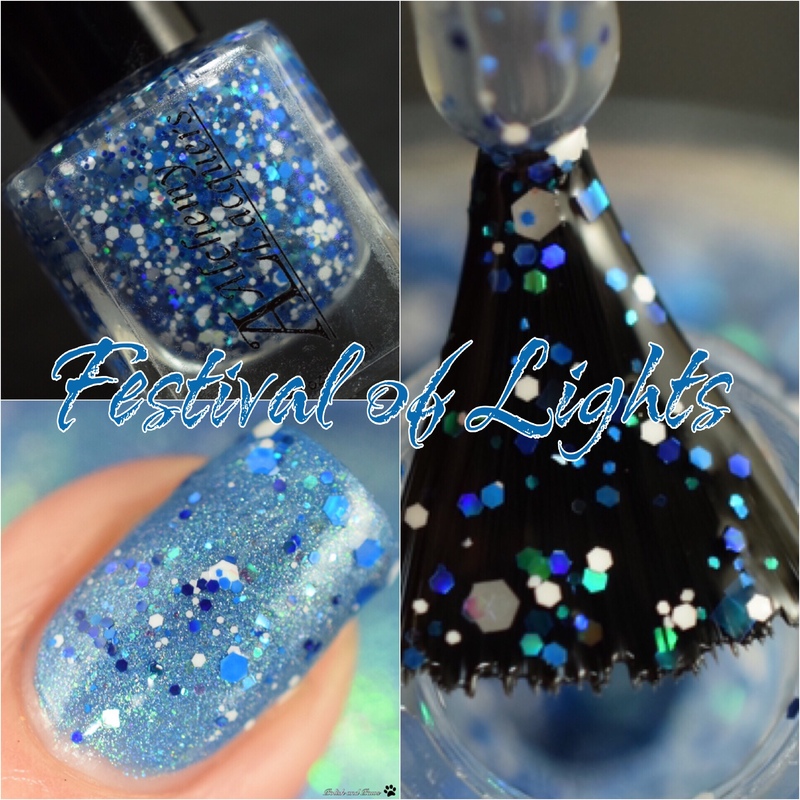 Festival of Lights is described as a glitter topper containing various sized blue matte/holographic glitter, white matte glitter, and blue iridescent glitter. 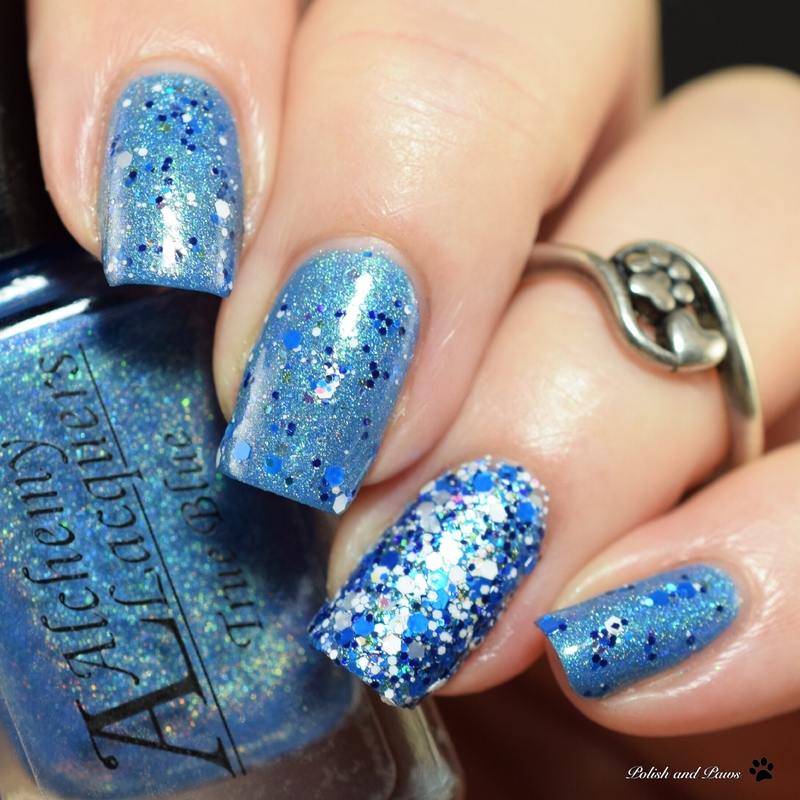 For my swatches I painted one coat over True Blue, with the exception of my ring finger where I sponged it on for full coverage. 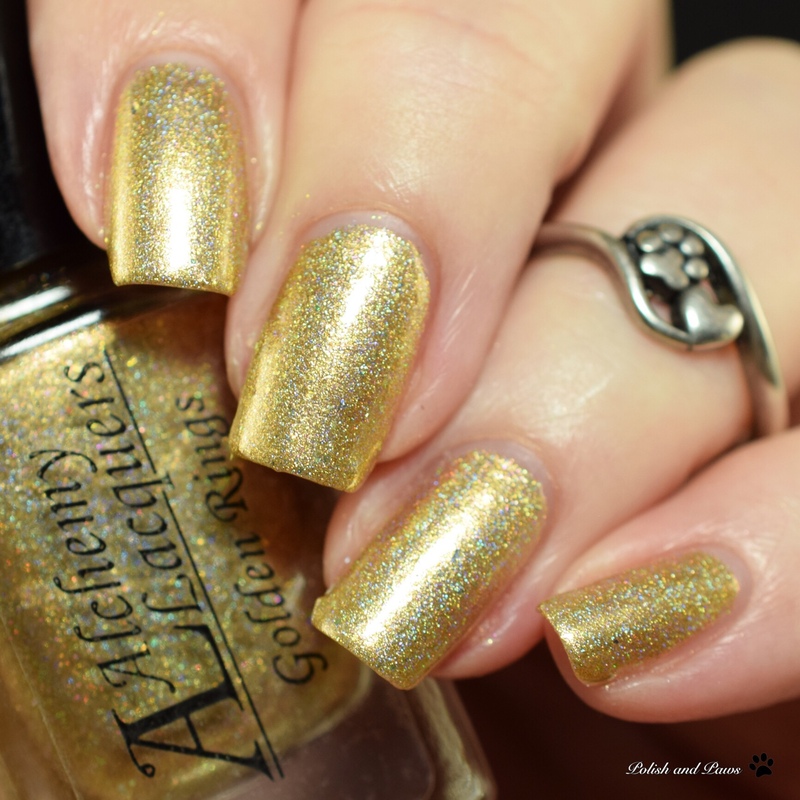 Golden Rings is described as a metallic gold nail lacquer containing gold/lime/turquoise shifting mini flakes with a linear holographic finish. The mini flakes really come through in this one. Flawless formula. 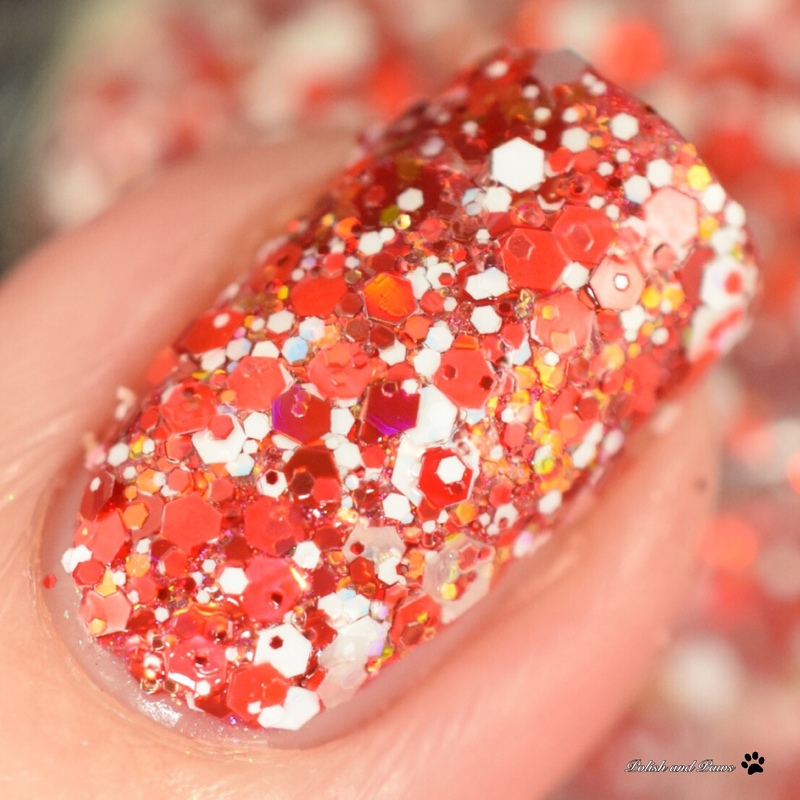 My swatches show 2 coats with glossy top coat. Silver Bells is described as a metallic silver nail lacquer containing holographic flakes, gold/lime/turquoise shifting mini flakes with a linear holographic finish. 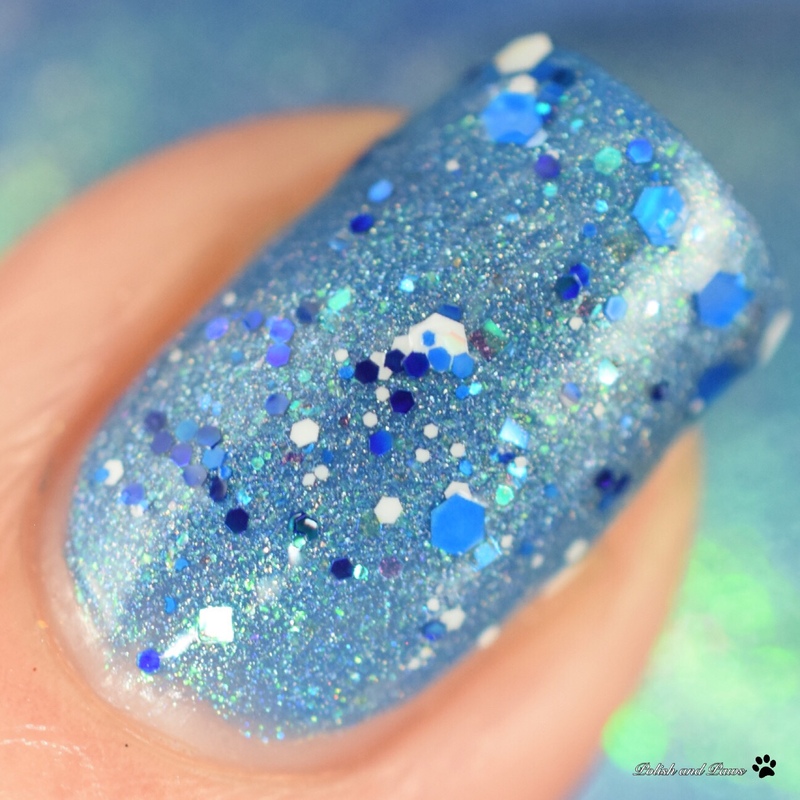 Check out all the flakes in the macro shot below, beautiful! For my swatches I used 3 coats just to be sure to cover my nail line, but you could probably get away with 2. Sealed with glossy top coat. How fun are these? They all go so well together. My personal favorites are Peppermint, Forevergreen, String of Lights, Festival of Lights, Golden Rings, and Metallic Melody. 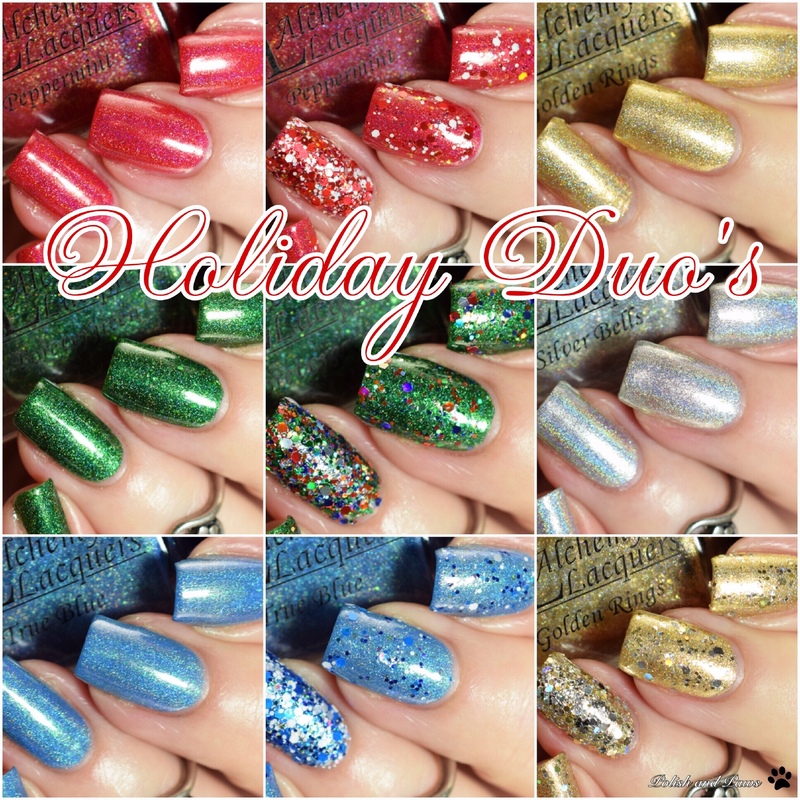 The Holiday Duos are releasing Thursday, December 6th at 7 PM EST. 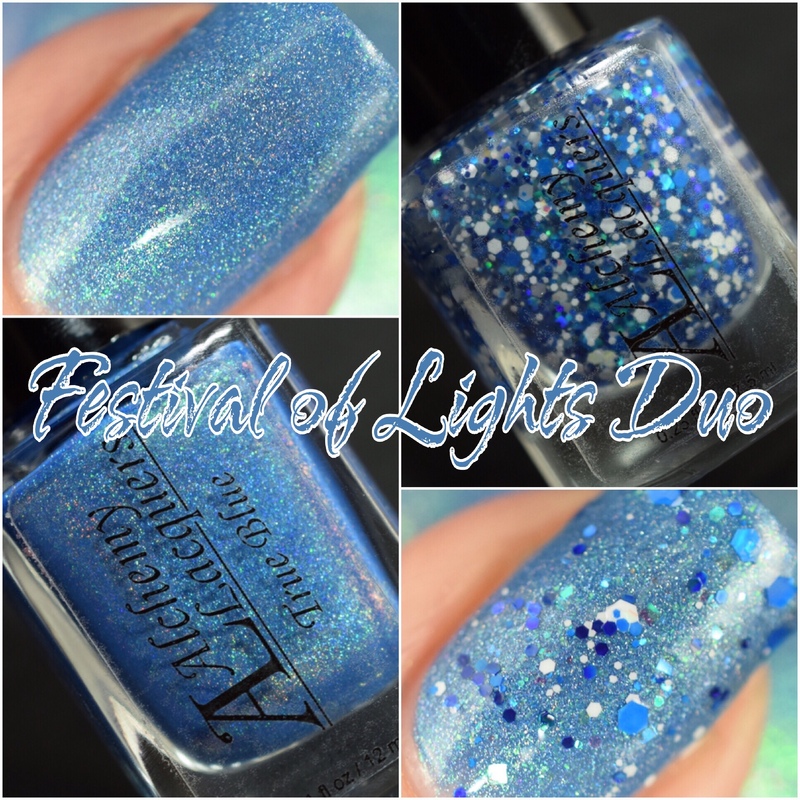 Do you have a favorite duo? I’d love to hear in the comments below! 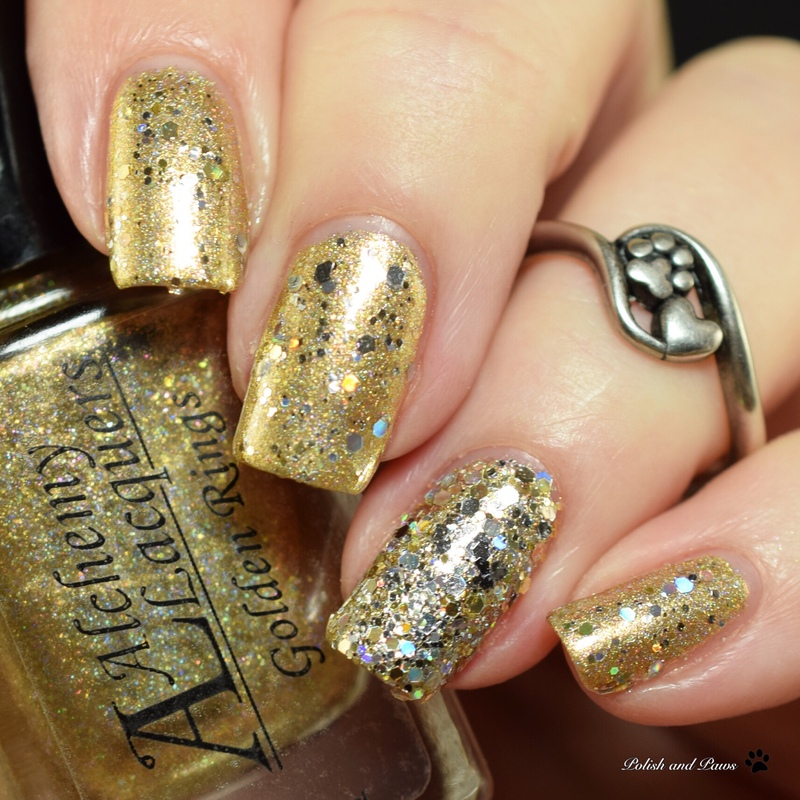 Alchemy Lacquers: Etsy shop ~ Facebook ~ Fan Group ~ InstagramUntil next time, stay polished! You did an excellent job showing these so well. The colors are so vibrant. 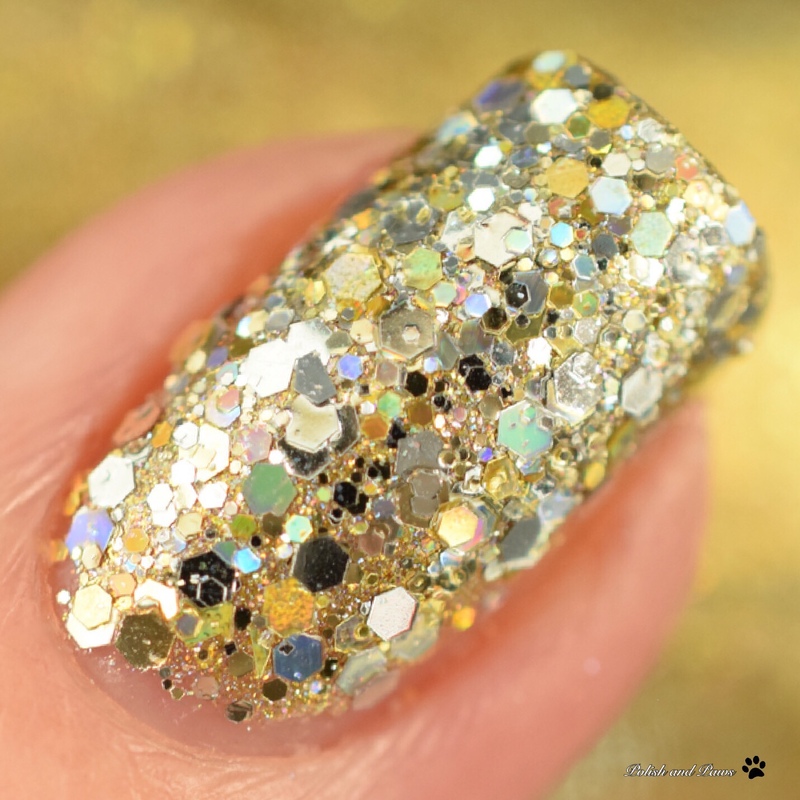 Sponging on the glitter is such a great way to make them pop. These are brilliant duos. I especially love the silver, gold and light blue. 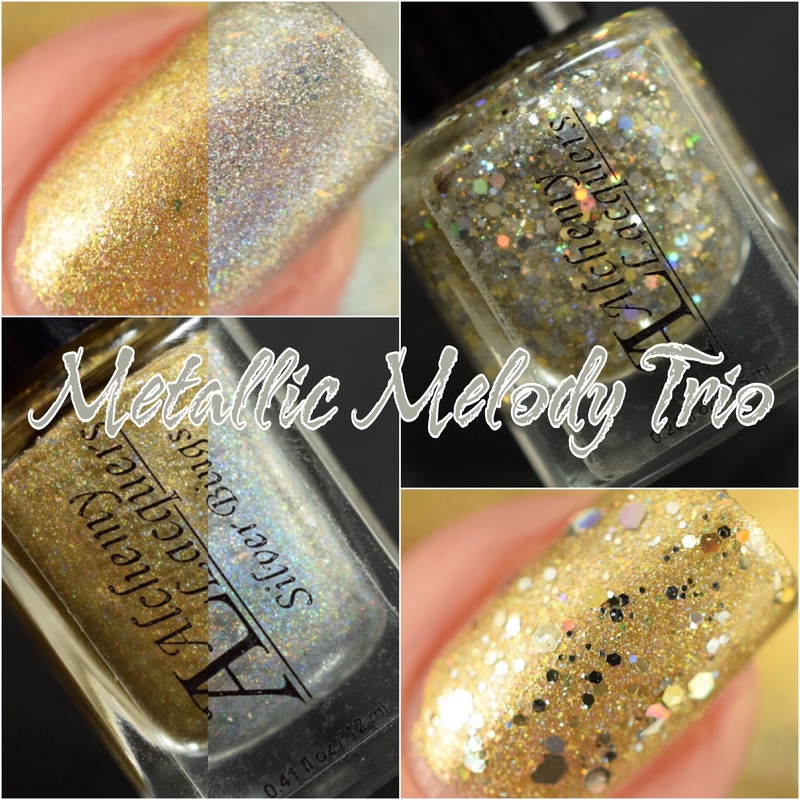 The metallic melody duo is my favorite of them all. Love gold. Wow I love your photos! 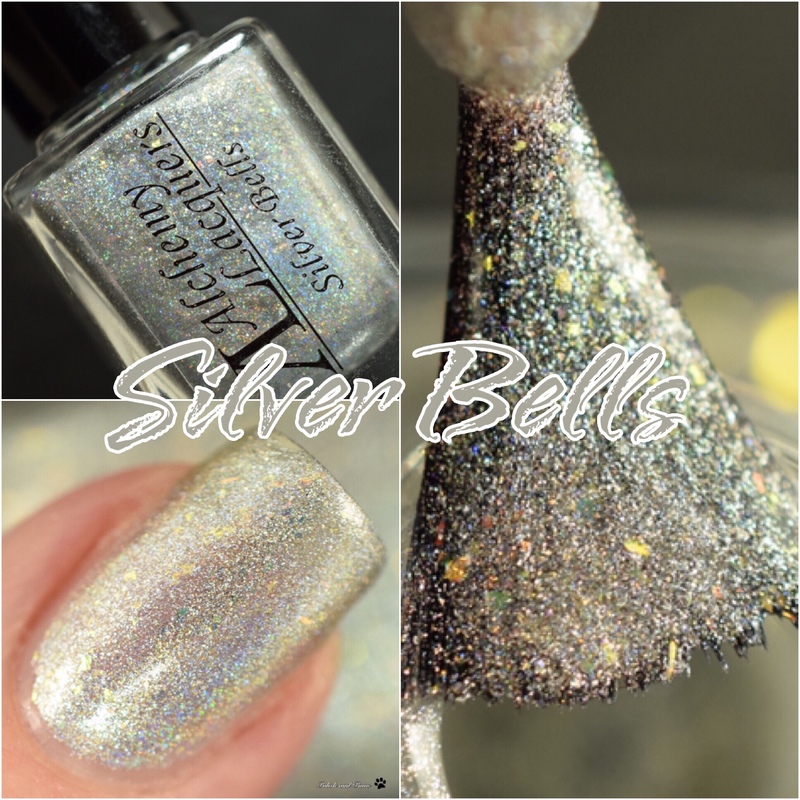 I love Silver Bells the most but those glitter toppers are so old school looking – back when indies were all glitter bombs. I love that retro look! They are all so festive and perfect for now! 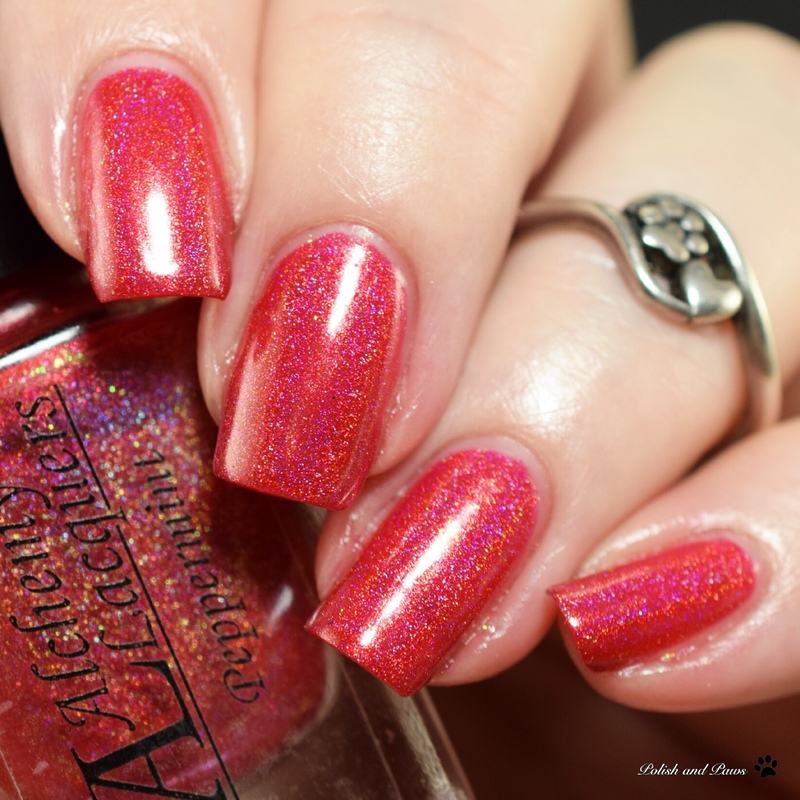 I love those foil holos! They are going on my list! I love the idea behind these duos! 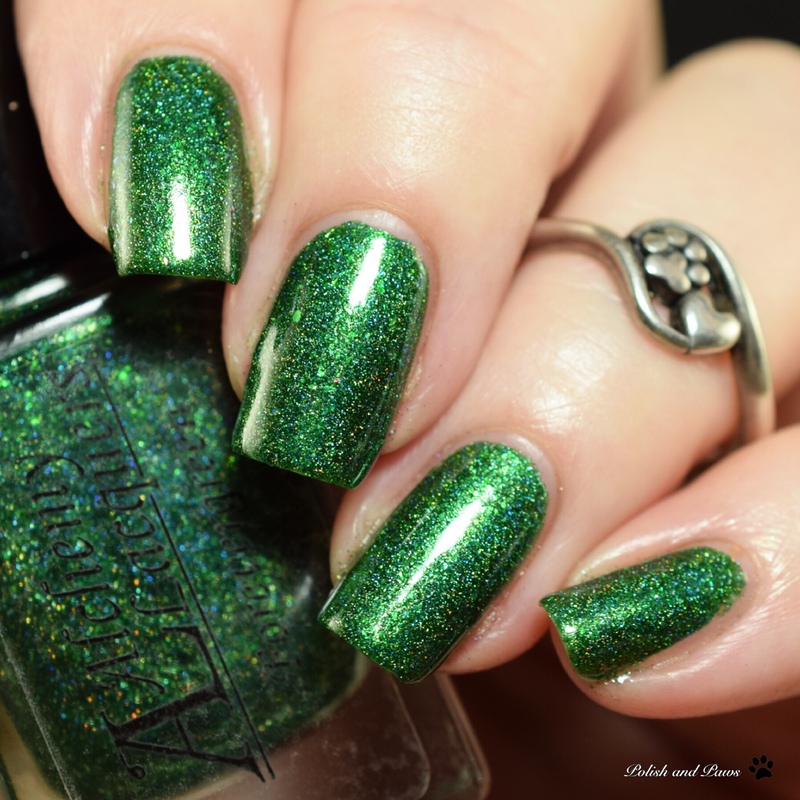 Forever Green is such a spectacular shade of green! 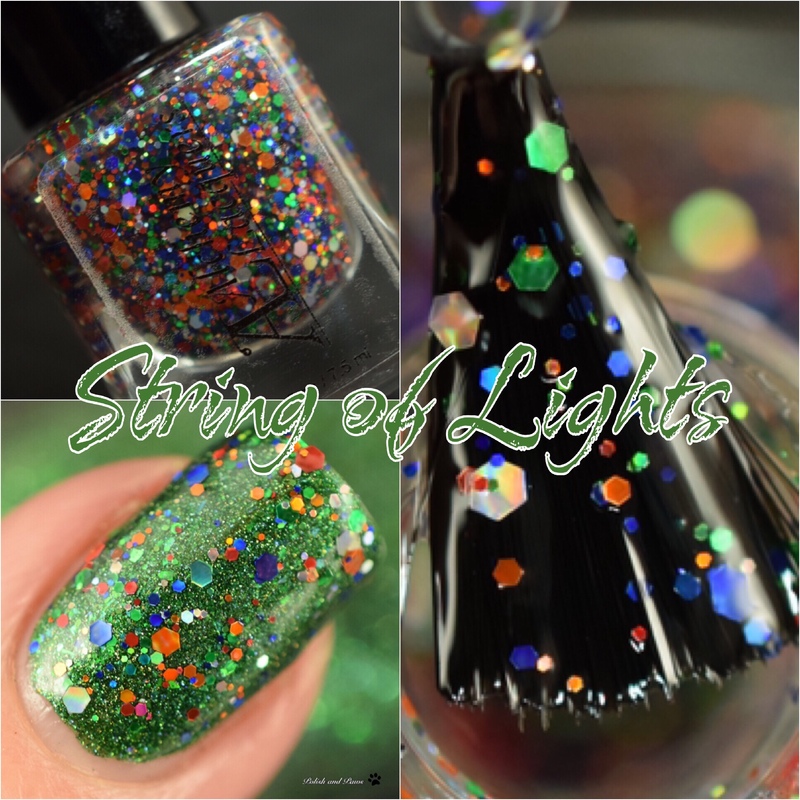 Strings of light topped on that green shade is soooo pretty!! !